US plane manufacturer Boeing has unveiled its 787 Dreamliner - the firm's first all-new jet since 1995. It is the only big commercial aircraft made mostly of carbon fibre rather than aluminium and is billed as the most environmentally friendly ever built. 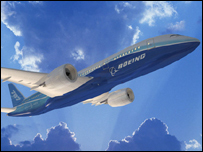 Boeing says the 787 is much more fuel efficient than its competitors and produces 20% less CO2. The firm says it already has more than 600 orders. The first test flight is expected in August or September. Sunday was chosen for Dreamliner's premiere as it is 8 July, or, in the American date style, 07/08/07. An audience of thousands were in attendance in Everett, Washington state near Seattle as the aircraft was presented to the media. "Our journey began some six years ago when we knew we were on the cusp of delivering valuable new technologies," Mike Bair, who heads the 787 programme, told the crowd. Hours earlier, Boeing said it had received 35 new orders for the plane. The orders, from Air Berlin and a Kuwaiti leasing firm, mean Boeing now has 677 orders from 47 customers for the midsize, long-haul jet. It is due to go into service next year, with Japan's All Nippon Airways set to be the first recipient as a reward for placing orders for 50 of the aircraft. Carbon fibre, which is lighter and more durable than aluminium, makes up about 50% of the plane's structure, including the fuselage and wings. This is intended to make the 787 fuel efficient. Boeing says the composite materials also mean air in the cabin can be more humid, leaving long-haul passengers less jetlagged. Phil Clapp, president of the National Environmental Trust, a non-partisan US group, told the BBC that the 787 was a "major step forward" but not the sole solution to aviation emissions. Some environmentalists say the lower operating costs will make air travel cheaper and simply encourage more people to fly. The first will carry between 210 and 250 passengers up to about 9,400 miles (15,125km). The Dreamliner is Boeing's first all-new plane since the 777, which began flying in 1995. It is crucial to Boeing's success, just as Airbus is pinning its hopes for the future on its forthcoming A380. However, the two are very different planes with different aims. The European firm sees its superjumbo plane as a response to airline calls for a bigger plane to meet increasing passenger numbers flying between major hubs. Boeing is taking a different tack, predicting that the future growth sector will be for additional medium-sized planes that can service smaller airports. Airbus is currently developing the A350, which is more of a direct rival to the 787, but it is not expected to roll out the plane until about 2011. Boeing received a boost at the Paris air show with an order for 50 of the aircraft from ILFC. Orders from plane-leasing companies - among the biggest global buyers of aircraft - are often seen as an indication of how a model will succeed in the long term. Assembly of the first Dreamliner began in May, although Boeing says that when full operation is under way, it will take just three days to put together each aircraft in final assembly. Can new aircraft be environmentally friendly?